To mark the 10th anniversary of the 2006 revival of the Presentation College Dramatic Society under Mr. Kieran Ahern, there was no better way to acknowledge this milestone than a production of Juno and the Paycock, Seán O’Casey’s powerful tragi-comedy set in Civil War-ridden Dublin. We were most fortunate to have past-pupil and current professional actor, James Browne, on board with us as our director. His expertise would prove to be a most vital component in getting this production off the ground and turning it into the success it proved to be. Such a huge undertaking is not an easy task and does not happen overnight. The whole painstaking process of auditioning, re-auditioning and casting began last September, requiring a committed group of actors and backstage team drawn from our 3rd, 4th and 5th Year students to dedicate their Wednesday afternoons and Saturdays during the short, cold days of winter to learning lines, continuous rehearsals and set-building, to be ready for show time in February. As always, we were most fortunate to be able to rely on the girls of Mount Mercy College, Model Farm Road, and also, for the first time this year, Coláiste Choilm Ballincollig, to provide for the numerous female roles that occur in this particular play. The girls brought a new dynamic and added dimension to this production, as we sought to remain as faithful as possible to O’Casey’s original text. In what seemed like no time at all, February 1st arrived, and with it, the first day of a week-long run of matinée performances for our own students and the students of Mount Mercy College. The hard work of all involved came to fruition, with O’Casey’s characters brought to life in vivid fashion before our eyes. Night-time performances followed for the parents, family members, friends and teachers of those involved, culminating with a supreme performance on the night of Saturday, February 6th, and all acknowledged with standing ovations. The Dramatic Society is indebted to Principal Ken Whyte and Deputy Principal Aiden Twomey for their unwavering support in facilitating such a demanding project, and also to the teachers and staff of Pres and the families of those involved for their support and encouragement. Finally, the last word must go the wonderful group of actors and backstage staff themselves who spent the time to bring the production to its successful completion. Potential future Oscar winners, perhaps?! Mol an óige agus tiocfaidh sí, gan amhras! 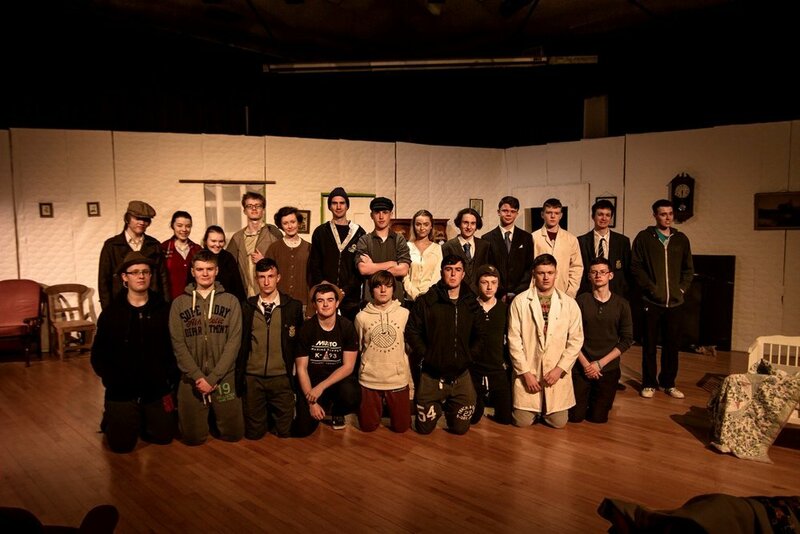 Our students have certainly lived up to the ideals and professionalism of the Dramatics Society. We look forward to the flame of enthusiasm and creativity continuing to burn brightly in next year’s production. All My Sons’ - Student Reflections This past year, PBC Drama put on the play ‘All My Sons’ by Arthur Miller. Daunting as it was taking on a piece by one of the 20th century’s best playwrights, everybody was eagerly awaiting the first day of rehearsals in late September. Even from the initial read through, it was clear to see that there was a very talented cast, crew and director. To say that this successful production was achieved through collective hard work would be a complete understatement. From the actors doing their thing on stage, to the hectic goings on of the backstage crew, our team had worked very hard for several months in order to prepare for a successful week of shows that were a constant frenzy of excitement and nerves. The backstage technicalities are what brought the show together on stage, and a big thank must go out to all of our backstage crew who did outstandingly well in dealing with times of chaos. The show would not have gone nearly as well as it did if it were not for these unsung heroes. And of course, the show wouldn’t go ahead without the talented actors, their passion, determination and dedication were the admirable qualities that gave this show its spirit. Long hours of after school rehearsals and endless hours of line runs were then what brought the play to life on stage. As all plays do, in the weeks leading up to the opening performance, elements of doubt came seeping through all involved. However, once the set went up, any shadow of apprehension subsided. We had become a team! Each one of us was relying on the next. It was a fantastic experience trying to improve our individual and collective skills. All of this said, none of this would have been possible without the supervision and direction of staff members, Kieran Ahern and Ronan O'Mahony. Their dedication to perfection is what really brought this production of ‘All My Sons’ to fruition. Their desire for a brilliant and powerful show essentially is what kept the actors and crew constantly motivated, and their help and direction throughout the entire process was greatly appreciated by all those involved.